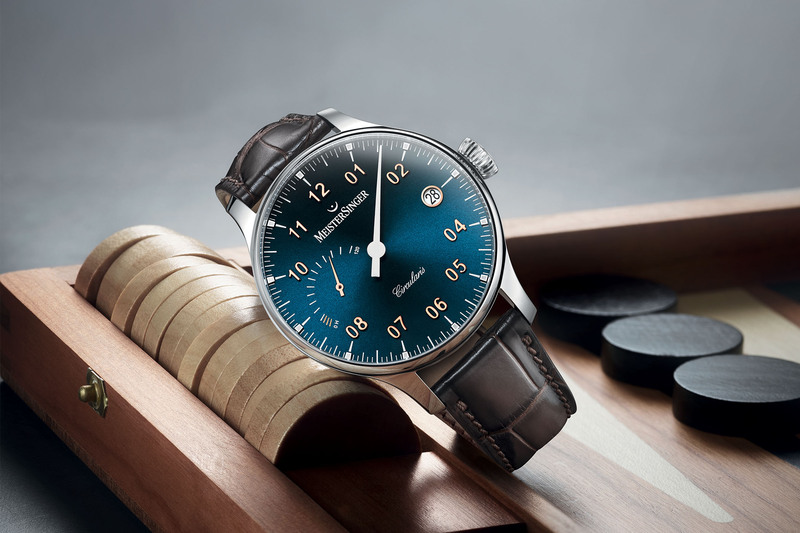 Meistersinger, who are known for their single-hand watches, have created for the first time a bit of a sporty timepiece. 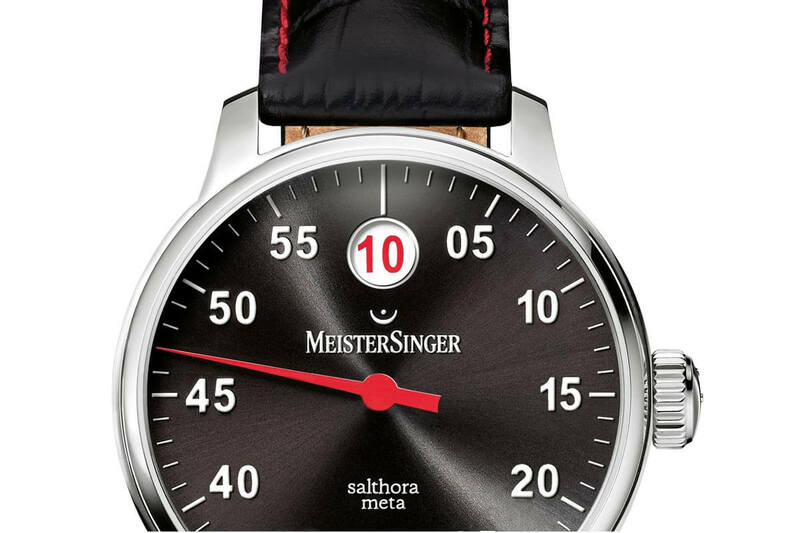 Most Meistersingers indicate time with one single, needle-thin, hand, which rotates around the dial in twelve hours and points to the nearest five minute marker around the dial The Salthora Meta, is a new, slightly sportier, iteration of the Salthora with its jumping hour indication, which was introduced last year. 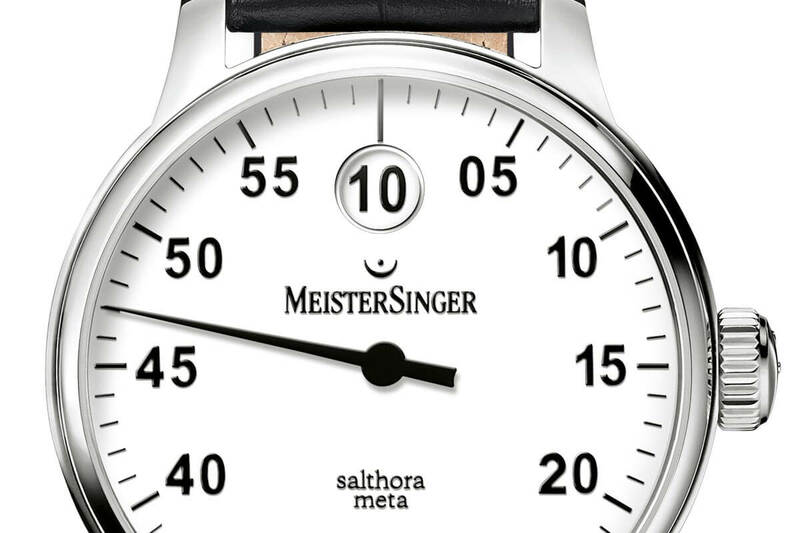 The Salthora’s time indication is in that perspective different from most Meistsersingers, although the long, needle-thin hand does exactly the same as on (most) other Meistersingers. Now however, its time indication is being supported by a jumping hour that is visible through a round aperture at the 12 o’clock position. Instead of hour markers, the dial now features minute indices, and the thin long hand is now ‘degraded’ to a classic minute hand. As soon as the hand reaches the middle of the aperture, every sixty minutes, the number denoting the next hour appears in the window. In our previous article about the Salthora, we showed you the Salthra’s inner works and explained how the jumping hour mechanism works. Fact of matter, is that jumping hour mechanisms, when not build properly, can cause a huge fluctuation of the powers in the gear train. 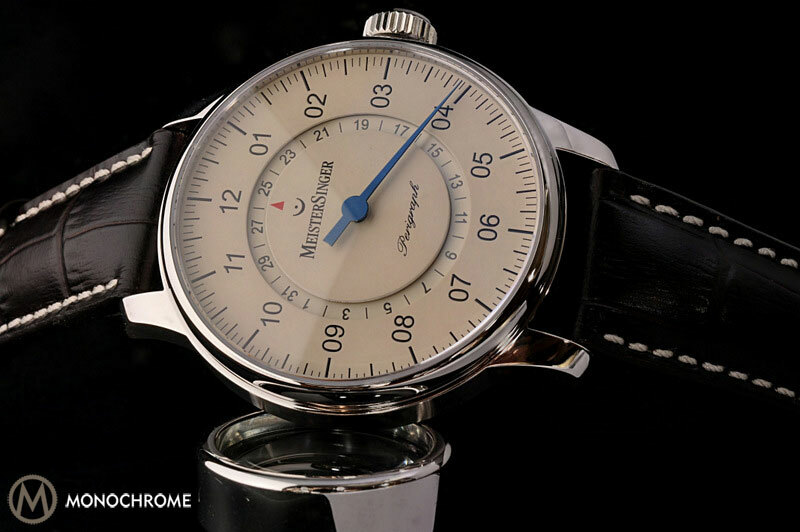 Meistersinger, like most others who constructed a jumping hour mechanism properly, has chosen to gradually built up the energy required for the jumping hour, during the course of 60 minutes, and it only influences the movement’s workings to a minimal degree. 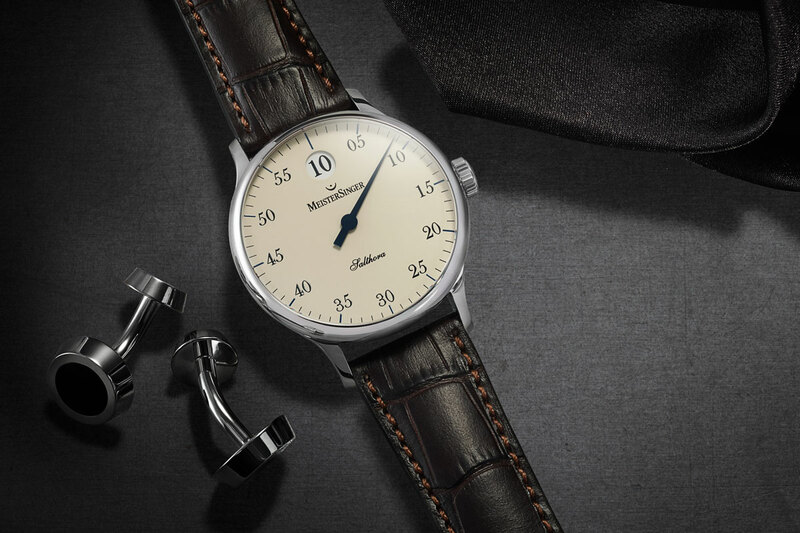 Until now pretty much every Meistersinger sports a classic look, and the new Salthora Meta is the brand’s first ‘sporty’ wrist watch. Especially the black and white versions look sporty, although the blue and ivory-coloured dial version blend the classic colour scheme with sporty looks. 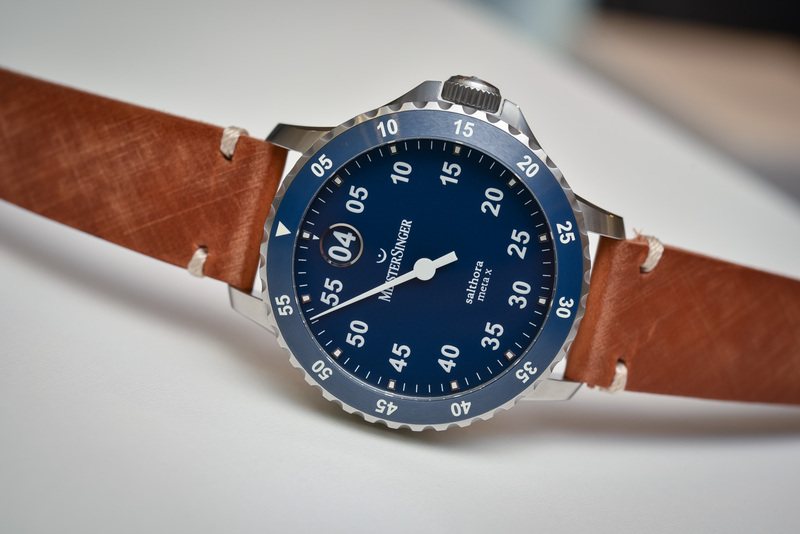 The Salthora Meta is 43 mm in diameter and its stainless steel case is water proof up to 5 atm (or 50 meters). It is fitted with an exhibition back, so you can see the extremely rugged and reliable automatic movement, which can be either a ETA-2824-2 or a Sellita SW 200-1. The three versions on the left feature a white hour disk, with black hour numerals, except the black Salthora Meta. That one features a white hour disk with red hour numerals, matching the signal red minute hand. 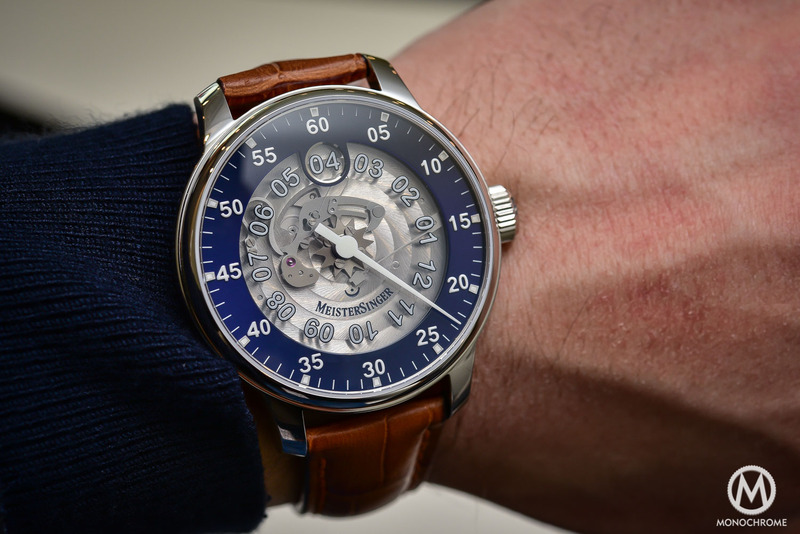 A cool detail on a very nice and attractively priced timepiece! The Salthora Meta will be available from June onwards. As soon as we hear the official retail price, we’ll update this article, although it’s safe to assume the price will be close to the ‘normal’ Salthora models, which is € 2.498 including 21% VAT/tax.